St. Patrick's Day is just a couple weeks away! Start your holiday crafting by making a few rainbow crafts with your kids. We've found some easy, inexpensive, and awesome projects for you all to try. Use these crafts as gifts for friends and family or display them in your home for spring decor! Rainbows are so beautiful and these colorful creations are no exception. Spring is here! Which means there are a lot of rainy days ahead of us. After the rain comes beautiful rainbows. Paint a few of these pretty rainbows with this cute craft tutorial. Puffy paints are super fun to craft with. I love all of the different colors they come in. Try these rainbow cards with your kiddos for some St. Patrick's Day crafting. You'll need red, orange, yellow, blue, purple, and white paper to create this 3D paper rainbow. It's a super easy project. Use pasta, cotton balls, and yarn to make a pretty rainbow mobile. Your kids can hang these around the house for St. Patrick's Day decorations. Use old toilet paper rolls to do some craft stamping for St. Patty's Day. Cut the tubes to stamp colorful rainbows. Who doesn't love holiday candy? Fill mason jars with rainbow colored candy to make these cheap and easy mason jar treats. These are perfect for St. Patrick's Day. Hand them out to friends and family. Your little ones can make all of their friends one of these rainbow friendship bracelets for a little St. Patty's Day gift. These are really easy to craft during an afternoon of down time. 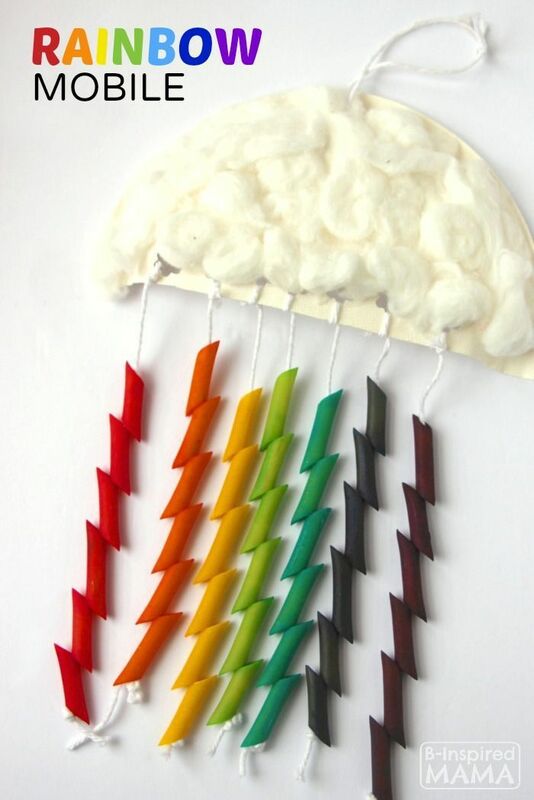 These rainbow tissue paper windsocks are perfect for the stormy spring weather. Put together a bunch of these with your kids and watch them go!